"A wonderful delicate dish, quick to fix. It is especially nice served over angel hair pasta or white rice." To same skillet, add shallots and garlic. Saute until softened (1 minute). Add water, wine, broth mix, and seasonings. Mix well. Cook, stirring frequently, until liquid is reduced by 1/2 (3 to 4 minutes). 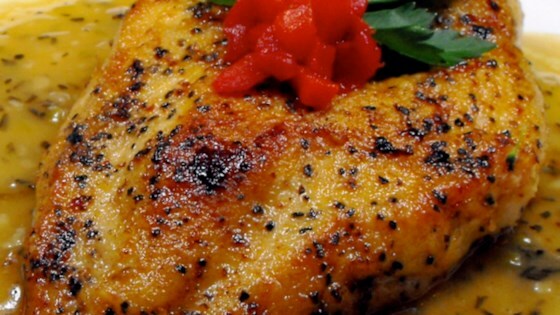 Return chicken to skillet, and cook until sauce is thick and chicken is heated through (2 to 3 minutes).